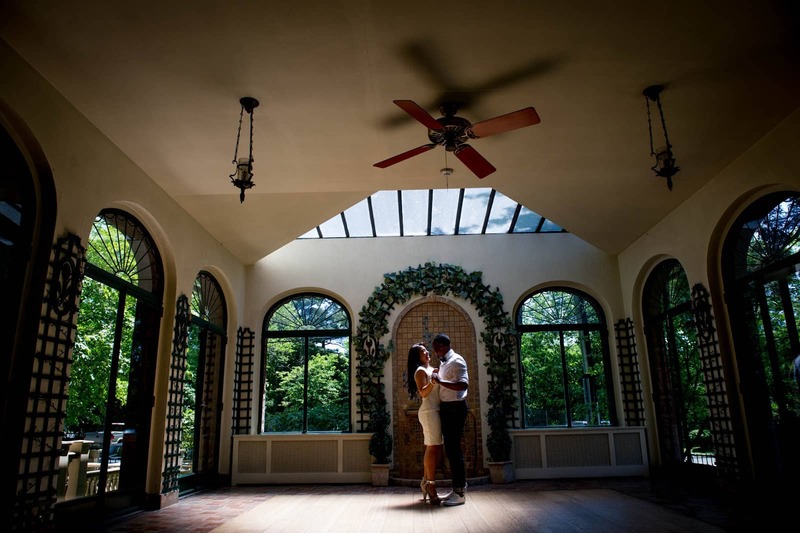 The bride wanted The Great Gatsby theme for the engagement shoot and the wedding coordinator, Corrine, could read her mind and suggested a magnificent mansion in Bloomfield. The team of Photosmadeez with the couple, Jacqueline and Jamiel, arrived at the desired destination to give a new dimension to the clicks which would not only be of contemporary art but also include vintage props like phone & radio from yester years and antique furniture. The bride’s sister had been constantly with us for our support and her inputs were of great help. Jameil our young handsome groom as Jay Gatsby and Daisy Buchanan is our beautiful bride Jacqueline, looked stunning and passionate about each other in all the posses. Jacky had chosen three rings for their wedding for Jameil to pick. To Jacky’s s surprise, our artistic groom designed a ring out of the three chosen ones and MY!! MY!! How could Jacky not be stunned. The beautiful mansion, the picturesque beauty of the nature and our wedding couple made each click memorable and unique in its own way. Its was a delight working with the lovely couple.